Administration Administration How is the Real Estate Center governed? An advisory committee appointed by the governor approves the Center's budget and research agenda. These are submitted to the dean of the Mays Business School and from there to the Texas A&M University System's board of regents for approval. Texas A&M University provides payroll, auditing and other essential support. Day-to-day operations are led by the Center's director. Advertising Advertising Does the Real Estate Center accept advertising, either in Tierra Grande or on its website? Not at this time. We do maintain a list of potential advertisers. To be added to the list, send an e-mail to Senior Editor David S. Jones. Advisory committee Advisory committee How does one become a member of the Center's advisory committee? Appointments are made by the governor with senate confirmation. Article submission Article submission How do I submit an article to Tierra Grande magazine? We do not accept unsolicited manuscripts. Send article queries to the Director of Research Dr. James Gaines​ or Senior Editor David Jones. Most articles published in Tierra Grande are written by our research staff, or they are based on research funded by the Center. Change of address Change of address How do I update my mailing address? Tierra Grande - If you are a Texas licensee, call or go to the Texas Real Estate Commission website and update the address they have on file for you. There is no charge. If you are not a licensee, contact our subsc​ription manager​. They will need both your old and new address. Contacting the Center Contacting the Center How do I contact the Center? ​​​See "Contact Us" at bottom. Data Data When is data updated on the website? Multiple Listing Service numbers are updated on the 20th of the month or the first business day thereafter. Building permits are revised during the last five days of the following month. Updates are posted to the Center's website within 24 hours of the raw data being released by the Census Bureau. Employment numbers are updated every two weeks. Education Education What real estate classes does the Center teach? Can I get a real estate degree from Texas A&M? ​​​The Center offers a variety of seminars and conferences, but it does not teach classes. Texas A&M offers the Master of Real Estate Degree (formerly the Master of Land Economics and Real Estate degree). For information on the master's degree, contact Angela Degelman at 979-845-4858. Funding Funding How is the Real Estate Center funded? Real estate licensees fund the Center through a portion of their license fee. Salespersons and brokers each pay $20 per year. Instructor Instructor How do I become an approved real estate instructor? Instructors are approved by the Texas Real Estate Commission. You should contact them. Market data Market data Whom do I contact with questions about the market data? ​​Send an e-mail to Edith Craig. Location Location Why is the Real Estate Center at Texas A&M? When the Center began in 1971, several Texas universities had the opportunity to house what was then called the Texas Real Estate Research Center. Only Texas A&M University, however, showed the enthusiasm Texas licensees sought for the new Center. The enabling legislation passed by the Texas legislature put the Center at Texas A&M. Ordering reprints Ordering reprints Are reprints of Tierra Grande articles available? ​Although we do not provide reprints, you are welcome to reprint the electronic versions from our website. For bulk orders, contact the senior editor. Out-of-state inquiries Out-of-state inquiries I have a question about real estate in another state. Can you help me? Because we are funded by Texans, our focus is on Texas. We do not have the resources to acquire data on other states. Some limited data, such as Census Bureau employment and population ​​statistics, can be found under the data tab on the Center's website. Physical address Physical address What is the Center's physical address? ​​The Real Estate Center is located in Two Research Park, a building in the Texas A&M University Research Park west of the main campus. Our physical address is 1700 Research Parkway, Suite 200. Our postal zip is 77843-2115. See map here. Real estate license Real estate license How do I obtain a Texas real estate license? ​The procedures for obtaining a license are outlined in the Center's free publication, Obtaining a Texas Real Estate License. RECON republishing RECON republishing May I republish RECON (Real Estate Center Online News) on my website, in my newsletter or elsewhere? RECON may not be republished in any form. Users are encouraged to publish links to relevant RECON issues. RECON submission RECON submission To whom should news items for RECON be sent? ​Associate Editor Bryan Pope is responsible for RECON. The article is not resold for profit. The author(s) byline is retained. 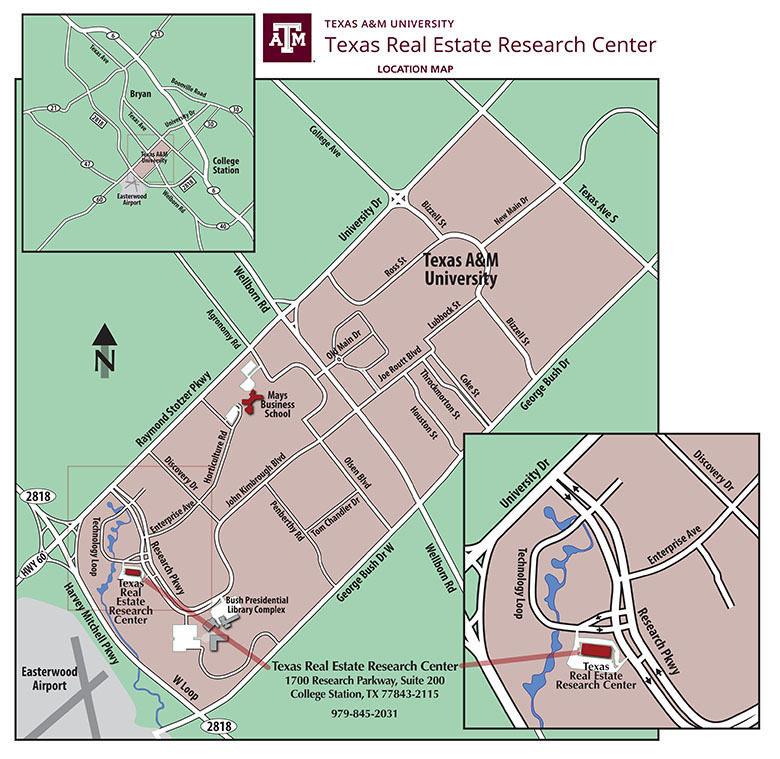 "Real Estate Center at Texas A&M University" is cited as the source. No substantive changes are made to the original. Send the senior editor a copy of the reprint as it was used, either to the physical address given above or by email. Research Research I have an idea for a research topic. Where do I send it? Ideas should be sent to Dr. James Gaines, director of research. Speakers Speakers Under what conditions might someone from the Center be a speaker for my organization? ​The Real Estate Center does a limited number of presentations to real estate related trade groups throughout the year. Be advised that the Center's staff of five speakers also has numerous other responsibilities producing and disseminating quality research, which is the principal mission of the Center. Speakers are in tremendous demand and are booked months in advance. Requests should be directed to Director of Research Dr. James Gaines. Software Software Does the Real Estate Center recommend computer software? ​​​No. At one time, we did maintain a real estate software directory. That has, however, been discontinued. Tierra Grande sample Tierra Grande sample How would I obtain a sample copy of the Tierra Grande magazine? ​​Send a note to Patsy-Rose Goodnight​. Tierra Grande subscription Tierra Grande subscription Although I am not a real estate licensee, I would like to purchase a subscription to Tierra Grande magazine. How do I do that? ​​​​Paid subscriptions to Tierra Grande magazine are no longer offered. The current magazine, including a digital version, may be viewed on our website​. Individual articles are available in the research library. Tierra Grande subscription opt-out Tierra Grande subscription opt-out I am a TREC licensee. How do I cancel my Tierra Grande subscription? ​Only the individual recipient may request their subscription be discontinued. Send (1) full name, (2) TREC license number (3) TREC license type (sales, individual broker or ERW individual) and (4) contact information (email or telephone number) to: circulation@recenter.tamu.edu. The request may also be mailed to: Circulation Manager, Real Estate Center, 1700 Research Pkwy, Ste. 200, College Station, TX 77843-2115.